To perform research and education about those hardy and enterprising early ancestors from the Netherlands who concentrated their efforts, labor, and skills in building the enduring greatness of the United States of America. To educate, preserve, and increase the knowledge of the history of Dutch settlement of the United States of America by the preservation of documents and the recording of family histories, lineages, and traditions. To be involved in charitable and educational efforts and to support patriotic, genealogical, literary, historical, and social acitivities that further the purposes and objectives of this Society within our country. 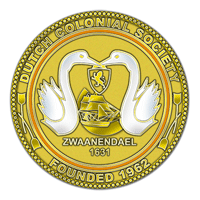 In furtherance of those goals, we welcome those of Dutch descent to inquire about membership in the Society in order to build a group of distinguished persons devoted to preserving the history and culture of our Dutch ancestors and their settlement in the New World.